Sometimes you've just got to get sooo drunk to remember why you want to be healthy again! I almost had a night on my own, feeling fed up and sorry for myself, but then my best friend came and kept me company and we drank far too much alcohol. You've got to do it every now and then. 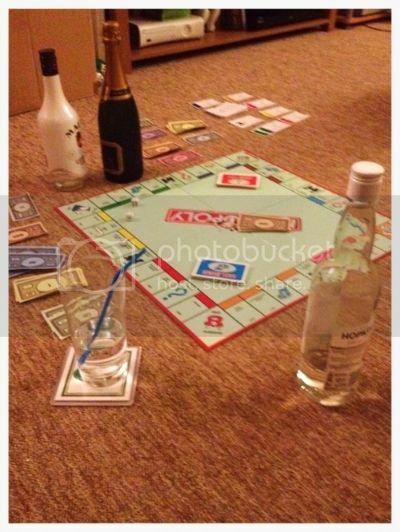 We had some champagne and Bacardi with lemonade, played Monopoly, listened to music and reminisced about Ibiza. It was fun but I am feeling it now. Headache included. 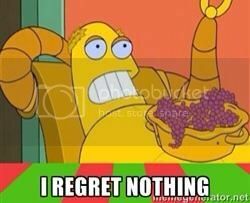 Still, no regrets though!! All I've got to do today is put some washing on and do a bit of hoovering, but I might just lay on the sofa under my quilt and get Jim to do everything instead. Now it's time to be healthy again. I started the day with porridge, dark chocolate chips, banana and almond butter. It wasn't as nice as it sounds to be honest. May have crumpets and scrambled egg for lunch and Jim brought home some steak to have for dinner tonight, mmmmmm. I'm off to make a coffee and watch Sunday Brunch, ciao for now!